Grow Your Own Ginseng, Save the Trees! The most asked questions we get are - How much is ginseng selling for? When are the roots ready to harvest? Who do we take it to sell? Where can we find a dealer? Well, I'm sure the price for good quality, dry ginseng will be different within 7 or 8 years when you get to the point when you are ready to sell your roots, but over the last 3 or 4 years, it has been going anywhere from around $250 to $500 per pound. The "explosion" of prices of ginseng came in 2007 and 2013 when wild ginseng hit close to $1,000/lb dried and woods-grown and wild-simulated ginseng roots fetched $350 to $750/lb dried, depending on the age and quality of ginseng roots. I expect this price trend will stay and will be strengthened further due to the growing demands in the Chinese market. Who do you sell it to? That is a hard question! First, I would try to keep it in the state where you live. It is a protected plant but it's ok to grow your own, but when you start taking it out of your home state, you will have to purchase a license. If you can't get a fair price for your harvest and you have a lot of rootlets, getting them licensed will be a better option to get a higher price. It's not hard to find a dealer to sell to...it's hard to find one that will give you a fair price for good quality roots. For those of you who have no idea who your state ginseng dealers are, there is a "Ginseng Dealers" list on this site according to state and more states to be added soon. When you sell it to a dealer, he takes it to another dealer and that dealer takes it to someone else. It passes hands maybe 5 times before it actually gets exported to China. Everyone tries to find someone higher up the ladder so they can bypass the middle man, but this is almost impossible because they are interested more than the small grower can supply. They are interested in TONS! If you sell it for say-- $400 /lb by the time it gets to be exported, they will probably be paying 4 or 5 times that amount. That doesn't sound real but it is true and you think you are making good money at $400 a pound. A lot of growers all around the Appalachian Mountain area are planning to form co-operations. They will have a grading system so you know what you have and you will get a pretty good idea what your ginseng is worth without someone picking through it and telling you it is low grade. You will probably have to pay a small percentage fee for your roots to be sold, but it will bypass a lot of hands and you will get a very good price - not to harm the dealers - just to get a fair price. Well, I'll write more on this later but so far I have heard nothing but good news for the smaller growers. More later! *If it is your first time, don't start out spending a lot of money on a large amount of seeds or roots. Start small and plant more and more each year. The most important thing is to START and to plant seeds or roots EVERY year. Each year you will have more and more ginseng roots and seeds, and you will become even more interested in it. Also, if you plant every year, when you do begin to harvest, you will have a harvest every year. GINSENG is a fleshy rooted herb, native to well drained, cool, shaded hardwood forests. Ginseng does not grow in full sunlight, so the natural place to plant it is in hardwood forests, where the trees provide the needed shade. Ginseng is a perennial plant, but unlike other perennials, it lies dormant some years and does not grow new tops every year. The root does not die, but lies dormant until the following year. Ginseng is one of the most sought after herbs on the market. The future for growing ginseng looks promising for many years as more and more is being used now in the United States in addition to the Orient. All Health Food stores, drug stores, and even small gas stations now sell it in capsules, powdered, etc. The demand for ginseng keeps growing every year. Highly prized by Asian cultures as an aphrodisiac and a cure for everything from impotence to lack of concentration, it relieves fatigue, mental and nervous exhaustion. The Chinese have always placed a high value on ginseng and millions have used it for centuries. Western people have remained skeptical of its use because the Chinese people prepare and use this herb in superstitious ways. Carrying a dried root in their pocket for good luck is one of these superstitions. It is said that the use of ginseng will add a decade of years to a human life. The most desired root for this purpose is one in the shape of the human body. These roots have been known to bring their weight in gold. The Chinese put the highest value on ginseng. It's used only by the wealthiest and will bring several hundred dollars per pound. 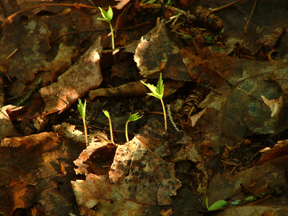 First year ginseng plants germinate in the spring. All emerged first year plants have 3 leaflets. 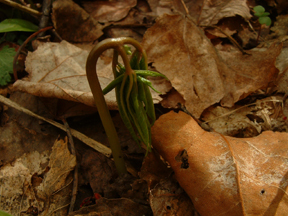 3 year old ginseng plant emerges in spring. Notice 5 leaflets on each of the 3 prongs. Ginseng grows in the wild about 1 foot tall and they bloom in the summer. The ginseng plant ripens in the fall or late summer with bright red berries, each berry usually contains 2-3 seeds. The seeds may be kept in damp sand for 1 year and used for replanting or they can be sold. In its wild, natural state, it grows in cool, shady, hardwood forest that takes about 6 to 8 years to grow to the point where its roots are large enough to harvest. If it is cultivated using fertilizers and pesticides, you can start harvesting the roots in about 4-5 years, but wild ginseng gets a much better price. Growers cannot expect to reap the rich rewards of the harvest overnight. Ginseng is a slow growing plant that takes years to grow, but in a few years you will have a great start for a huge profit. It is impossible to get the full picture of growing ginseng in any book. Everyone is different and have different plans. We hope that we can give you some ideas without making too many mistakes. Feel free to ask any questions at any time. The most important thing is to START and to plant seeds or roots EVERY year. Each year you will have more and more ginseng roots and seeds and you will become even more interested in it. Also, if you plant every year, when you do begin to harvest, you will have a harvest every year. It's OK to start small to get some experience growing ginseng. That's the best way and it will not cost you a lot of money. In 4 or 5 years you will start to have your own seeds to plant. Your small hobby or ginseng adventure will be getting bigger and bigger every year. 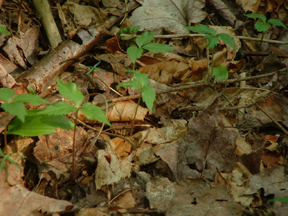 Ginseng can be planted in any hardwood forest or backyard that provides mostly shade. Plant seeds or roots in the fall from Sept. 1st through February and it will sprout up in the spring. It can grow in any soil except southern Florida. If you live in the USA or Canada and you're not sure if you can grow it, you can look at the zone map. For American Ginseng, zones 3 through 7 is fine. Zones 2 and 8 are border line. Ginseng will not grow in an open field like corn or soy beans. It needs about 70%-80% shade and rotten leaves makes the perfect place. Seeds can be planted individually throughout the woods, which is nature's way. 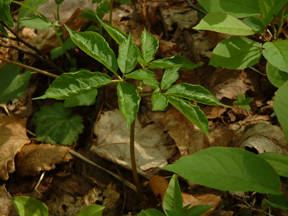 The closer it grows in its natural environment, the more characteristics of wild ginseng it will have. When planted under lath sheds or other artificial shade, the roots are heavier in weight, are shaped differently, and they grow faster. The Chinese do not value the artificial shade grown roots as highly as the natural grown wild ginseng, but the roots being usually twice as heavy means that you get twice as many pounds and it sells for about 1/4 or less of the price per pound of the wild. The plant is the same in either case, but the difference in value comes in how it is grown. Another method being used more extensively within the last few years is to find a well shaded place in the woods and rake all the leaves to the side and broadcast the seed lightly, then rake it in a little and cover it with mulch or use the leaves that you raked to the side, but don't use OAK leaves because they are too big and tough for the new plants to come up through. This method is much less time consuming than planting in rows. When planting in larger amounts, it is best to grub out the brush where you are going to plant. When planting in rows, plant the rows 8 to 10 inches apart and the seeds about 4 to 6 inches apart in the rows. Plant seeds 1/4 to 1/2 inch deep. As soon as they are planted, seeds should be covered with woods dirt. Seeds must never be left to get dry or they won't grow. After being planted and covered, cover them with about 1 inch of mulch so the plant can come through in the spring. That should be all that you have to do to keep it growing. The following fall should take care of the mulching by itself from the leaves falling, if you picked a good and natural forest area. Rotted leaves are best for mulch - never use straw or hay. It has too many other seeds in it that will grow like grass, weeds, and clover seeds. Mulch helps prevent heaving by frost and keeps the ground from drying out and baking. It is good to leave some mulch on all the time. When planted throughout the forest, this is usually taken care of by nature by the leaves falling in the autumn. Growing it commercially is good too, but it involves a lot of expense, time, etc., but it is profitable if you want to make a business of growing it but remember, you will only get a fraction of the price of wild-stimulated ginseng. If you decide to grow ginseng in your backyard, lot, or in the woods, keep it in an area of mostly shade. Plant the seeds and cover it with about 1 inch of rotten leaves or mulch. Plant the seeds in the fall and they will sprout up the following spring. If you plant seeds in small plastic trays or peat trays, you can transplant them when they become a couple of inches high. When planting in pots, use pots that are at least 8 inches deep and use only plastic - not clay pots. Clay pots seem to dry out more easily than plastic. Dig roots in the fall as the above-ground parts die back. Ginseng roots do not grow straight down. They are usually at about 45 degrees in the ground. Carefully expose the under-ground stem at the base of the above-ground portion, and follow it until it joins the top of the true root. Remember that the taproot may be forked and that it has many diffusely branched rootlets. Expose the whole root and wash as soon as possible, but do not scrub. A little soil left around the root rings may enhance its value. Spread cleaned roots on a piece of old ply wood or screen rack in the shade for drying. Don’t put them directly in the sun to dry. The sun will discolor the roots to some degree. Turn them frequently and provide adequate aeration. Drying time varies with root size and drying techniques. Large roots require three or more weeks to dry at room temperature or outdoors but small roots dry in a few days. I dry them until they just start to snap when you bend enough to break them. Do not oven dry or put them in the microwave. Drying too fast will discolor the roots. Store the dried roots in a dry, airy, rodent-proof place until ready for sale. In the fall, you can harvest your seeds from berries. Each ginseng berry generally produces 2 seeds. You can leave the pulp on. Dig a hole in a good well drained shady area about 1 foot deep, 3 feet wide, and as long as you want. Line the sides and bottom with brick or large rocks to keep the moles and mice out. There is no need to cement the blocks because you want it to be able to drain. If you have a small amount of ginseng seeds to stratify, you can even bury a 5 gallon bucket with plenty of drain holes drilled in it. Line the bottom with 1 inch sand then a 1 inch layer of seeds, then another layer of sand. Keep adding a layer of sand and a layer of seeds until you get to the top. Make sure the top layer is sand and cover it with a sheet of old plywood. If you would like to get involved or would like to share a story about growing ginseng with our visitors, please register to post your articles.